Legend has it that in the distance past, all animals lived together in a chaotic environment. One day, Jade Emperor gave an order that every species of animal had to find for them an area to live. Having heard the order, they scrambled for a place to reside. The three brothers of dragon who were living in a large lake hurriedly ran to the east but could not find any place; they then ran to the west. The two older brothers ran fast and came to the destination first. The youngest brother ran slowly and strayed into the crowds of lions, tigers and big cats. Fearing that these animals would attack it, the dragon opened its mouth to defense itself. At that time, the order of Jade Emperor was no longer available, so the three dragons petrified. 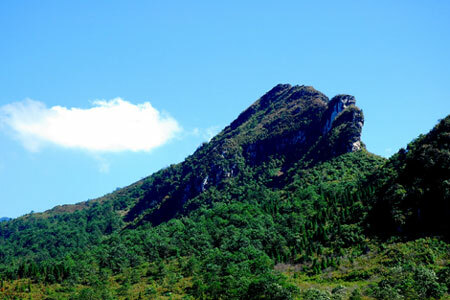 The two older dragons, which were waiting for their brother, face Lao Cai City, and the youngest one raising its head and opening mouth faces the Hoang Lien Mountain Range. So the mountain is named Ham Rong (Jaw of Dragon). Visitors to Ham Rong have chances to climb up the San May (Cloud Yard) to enjoy the panorama of Sapa Townlet, visit the orchid gardens with beautiful and colorful flowers. 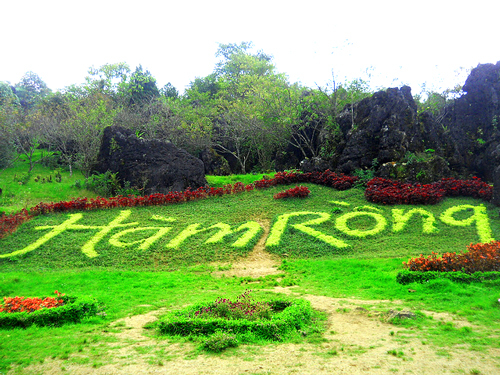 In addition, Ham Rong Mountain has numerous caves and stones in extraordinary shapes.